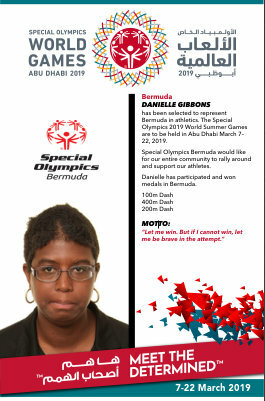 www.islandstats.com continues the countdown to the Special Olympics and we will feature every athlete selected to represent Bermuda. The Special Olympics 2019 World Summer Games are to be held in Abu Dhabi March 7th – 22nd, 2019. Gibbons has participated and won Medals in Bermuda during the 100m Dash, 400m Dash and 200m Dash. Special Olympics Bermuda would like for our entire community to rally around and support our athletes.